Apple has just announced that it will be releasing iOS 9.3, the biggest dot update for iOS, later today. I have been on the beta for so long I almost forgot it hadn’t been released yet. So, for those of you that are interested in finding out what iOS 9.3 is all about, we are going to go over all the new and hidden features Apple’s latest iOS provides. You can enable Night Shift in Settings and choose Schedule if you want the light emission to be based off the time of day. If you want an even faster way to access Night Shift, you can do so from the Control Center. Just swipe up from the bottom and you’ll see the Night Shift icon in the bottom-center row. Tapping on the icon will immediately place your device into Night Shift mode and dim you screen to your current settings. This is just an ON/OFF toggle, so for any adjustments you’ll still need to go to Settings -> Display & Brightness -> Night Shift. Update: Please note Night Shift is available only for 64-bit iOS devices, so it is not available on iPhone 5, iPhone 5c, iPod touch 5G, iPad mini, iPad 2, iPad 3 and iPad 4. Wi-Fi Assist is a great idea, but missing perfect implementation. While the goal is to help you maintain a connection even with a weak Wi-Fi signal, many owners complained about abnormally high cellular data bills because of the feature. In iOS 9.3 you can now see how much data Wi-Fi assist is actually using. Instead of guessing how much data is being used for it, you can see how much and disable or enable accordingly. There are some people who found the addition of password protected Notes to be stupid. But, I think the exact opposite. iOS 9 completely remodeled the Notes app and made it so much more powerful I use the app all the time for work. Sometimes I am just writing down a grocery lists, other times I am taking down notes from an important meeting and including documents and other potentially sensitive material. So, in iOS 9.3 you can now password and Touch-ID protect your Notes from prying eyes. Head over to Settings -> Notes -> Password Protection. Enter in a password and enable Touch ID. Now, this doesn’t password protect the app itself, but only Notes that you individually lock. To do so, open a Note, tap the Share icon and tap Pass Protect Note. You’ll enter in the password you created, and the Note will be locked. Now, whenever that Note is accessed, it will require Touch ID. I’ve been using the News app to follow all of my political news. While the app didn’t get any huge updates for iOS 9.3, it did improve an already good app. Apple has retooled the recommendation engine to suggest articles more tailored to your interests. You can also view video content from the news feed, without having to click on the article. So, that means more Bernie close-ups with less tapping. News app also added new gestures for quick actions to Dislike, Mute, Like, Save and more by swiping either left or right. Previously you could only sync iBooks to the cloud in the iBooks app. Obviously, since I literally don’t know a single person that has more than one iBook, the app wasn’t really doing much. Now, in iOS 9.3 you can sync a bunch of other items from your library, including PDFs. Quick Actions for the iPhone 6s and 6s Plus were a handy addition to iOS 9. With the use of 3D Touch, iPhone 6s and 6s Plus owners gained access to a mini menu that provided shortcuts to common actions on a per app basis. For iOS 9.3, Apple added a few more stock apps like, Weather, Settings, Health and more. Hooray Quick Actions. Live Photos were all the rave after the Apple Event. The short “video” effect added to photos is a really cool concept that people seemed to really enjoy. For iOS 9.3, the iPhone 6s and 6s Plus have new option to duplicate a Live Photo and save it as a still image. This is helpful for people who want to share Live Photos without having to revert the Live Photo back to a regular photo. Instead you have one Live Photo and one regular. All you need to do, is find a Live Photo and open up the Share Sheet. There will be a new icon titled, Duplicate. Click on this and chose either to simply duplicate the Live Photo, or duplicate it as a still image instead. Previously you needed to edit the photo to a still image from a Live Photo, but this is much more intuitive and easy to manage. In this latest update, iOS 9.3 makes an effort provide a built-in list of apps that will work with the Health app. Previously, there were many users confused on how to properly utilize the app. Now there are categories like, Sleep, Weight, and Workouts that each have a list of third-party apps that are compatible. It also works better with those of you that have an Apple Watch and simply improves the ease in which you can consume all your health-based information in one convenient place. CarPlay for iOS 9.3 add clean Apple Music integration that allows you to play personally recommended tracks and playlists based on your listening history aka the For You section for those that are users of Apple Music. Apple Maps in CarPlay now includes nearby location suggestions, making it much faster to find where you need to go with less time typing stuff in. 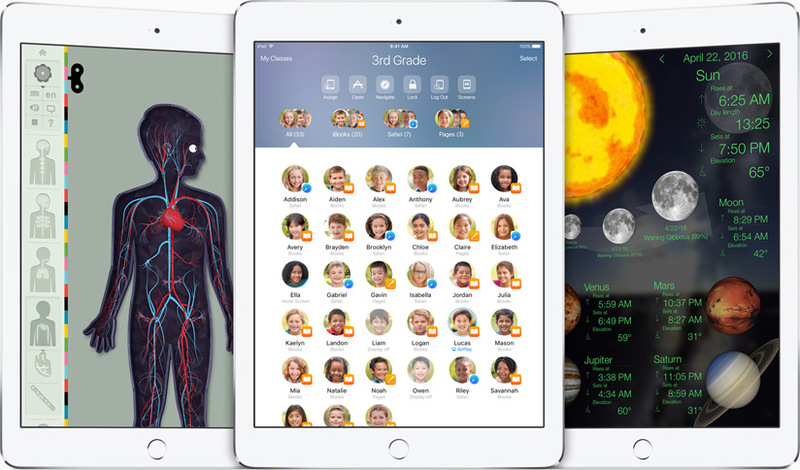 In a further step to flesh out its educational offerings, Apple has introduced in this update a new Classroom App which gives teachers a variety of ways to utilize iOS devices in school settings. A key feature is the ability to manage multiple Apple ID logins for iOS devices, allowing multiple students to utilize the same device with individualized profiles. Each profile will have all their Books, Apps, and other content synced to their login. Teachers can use a Screen View feature to see the current screens of classroom devices, and can even open apps on all the devices on the same time. Administrator profiles can purchase apps and books for all devices and they will be placed on all devices automatically. Apple is surely seeking to be the go-to name in education technology, and this seems to be a big leap forward. Siri now has support for Finnish, Hebrew, and Malay. If you have iOS 9.3 and watchOS 2.2 your iPhone will be able to pair with more than one Apple Watch. Each Apple Watch and iPhone must have 2.2 and 9.3 respectively. While using Apple Pay, there’s now a small icon that will open the associated app linked to the card or pass. Let us know what you think of the new iOS 9.3 features in the comments section below.